The counter units are custom made and programmed to fulfill many different needs. You can use them as a countdown ammo counter for a PR airsoft, or you can use them for vintage AMPEX tape units as a counter guide. The counters use a IR interrupter to count objects as they pass by (no direct contact). Or you can set up a reflective IR surface to count revolutions on a platter, drive motor, etc. You can also set the counter to count via trigger wires if you want to use a mechanical switch. We can even custom program the counter to act differently for your needs. Contact us for more info! Powering up the unit starts the counter display at "99". The start count is also programmable by the user. The unit counts down when the trigger wires are connected together or the IR interrupter detects an object has passed through its channel. 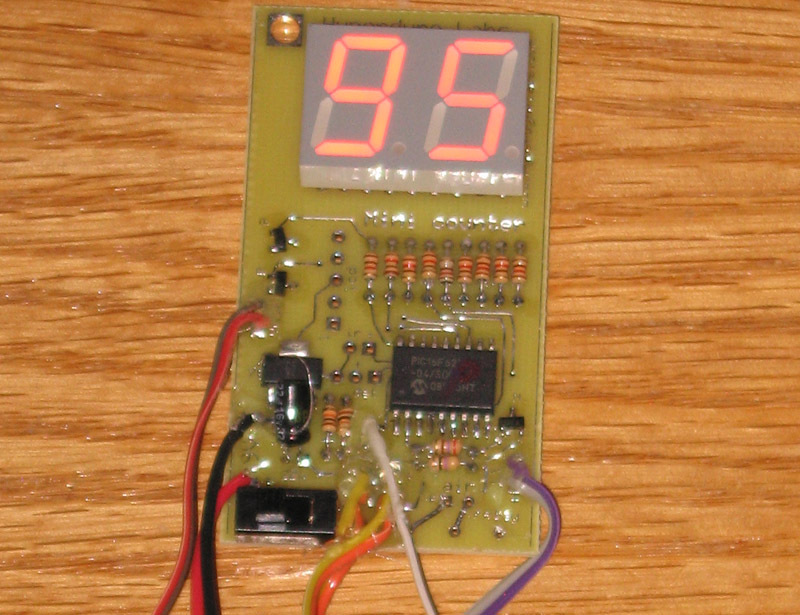 The unit counts down until "00" is reached, where the counter stays even if the trigger wires are still making a connection. Cycling the power repeats the process. The deluxe unit is basically an up/down counter that is controlled by the IR interrupter or refelctive IR setup. You can set the counter in up or down mode for counting. Each time the IR unit fires the counter increment/decrements by one - based on the mode switch. You can even manually set the count using the buttons. This unit was made for vintage AMPEX reel-to-reel tape drives, but can also be used in a myriad of applications where non-contact counting is required. 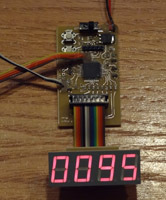 The counter board comes with a 4-digit display that is connected via a ribbon cable for maximum placement flexibility. Check out a movie of the countdown counter with IR interrupter in action. Small size: 1.2" x 2.4"